The new version of hours Classic Fusion Extra-Thin Skeleton 42 mm from Hublot.In the past, the famous watch company Hublot has pleased his fans magnificent clock. Last year at the Geneva exhibition company introduced the model in the housing with a diameter of 42 mm. Last year’s version of this was presented in a new version – in a ceramic housing. 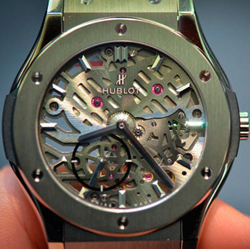 Equipped with a mechanism of manufacturing watches Hublot Classico. Thickness of 2.9 mm caliber consists of 130 parts, has a power reserve of 90 hours. Buy a watch Classic Fusion Extra-Thin Skeleton 42 mm will be as on a leather strap, and on the bracelet. The company will release other versions of the model with a body made of titanium and other materials.